We are joined today by a fellow Live-Free friend, Lesley Crawford. Lesley lives in Scotland, is a youth worker, and loves music. We love her heart for the Lord and pray you will also. I made it to the prayer room just in time. The anger within me was about to explode and I knew I would be unable to hold it back for much longer. I was aware that my reaction was out of proportion to the current situation, but something much deeper had been triggered. I didn’t have the words to explain and I doubted that anyone would understand if I tried. I needed to find a safe place to let it out before someone who knew. It was an unusual time of prayer- no holy words, reverent praise, or humble confession- just pain and rage and tears. It was fury over the injustice and demands to know why. It was ranting and raving while lying on a pile of beanbags in the corner of the prayer room, kicking like a toddler having a temper tantrum. I was far beyond the point of pretense or politeness. It wasn’t a very respectful time of prayer, but it was honest. It was real. And the thing I discovered that day was that God could take it. I could come as I was, not as I felt I should be. He knew my situation and he cared. As the anger finally drained away, it was replaced by a sense of comfort and peace. God was there. In the midst of the pain and the turmoil, he hadn’t abandoned me. I discovered that day what it really means to mourn- to honestly lament the injustice in the world and to grieve over the brokenness of life- but I also discovered the blessing that comes from knowing God’s comforting presence in the midst of it. As I finally left the prayer room that day, nothing had changed about my situation, but I was strengthened by the comfort of knowing that God was with me and I didn’t have to face it alone. Are you encouraged today to offer comfort to someone else? Reach out to that person with a call, text, card or visit. Is there a circumstance that you are grieving over? perhaps more than one? Write them in your notebook followed by, “Even if ___________ doesn’t change I rejoice and find strength and comfort in God, who will not leave me to face this alone. Join us tomorrow as we explore renewal in God’s presence. Doesn’t that sound like the perfect partner to comfort? Thank you for sharing!! Isn’t it so cleansing and comforting to bring all of ourselves, our joy, pain, anger, confusion, all of it, to Jesus and find comfort!! Thank you, Lord for meeting Lesley in her time of need and showering comfort over her! It’s empowering to remember that we are comforted that we may comfort. I’ve reflected a lot on that today as I remember past events and who God has allowed me to comfort and also whom he has sent to comfort me. It takes me back to our talks on community in his presence. I love seeing it all weave together Nancy. Thanks, Nancy! It is amazing how God meets us just where we are! Thank you for this post, I had my own bout of anger and rage 9/7/18 hurting, and loss of words… emotions swarming me…. I tried to go to jesus and pray but my words failed me and I just cried out his name. Oh, Keisha. Be comforted by this verse from Romans 8:26, “In the same way, the Spirit helps us in our weakness. We do not know what we ought to pray for, but the Spirit himself intercedes for us through wordless groans.” I am so thankful that there is power in His name! Thanks for sharing this, Keisha! The amazing thing is that God knows exactly how we feel and what is happening even when we can’t put it into words. 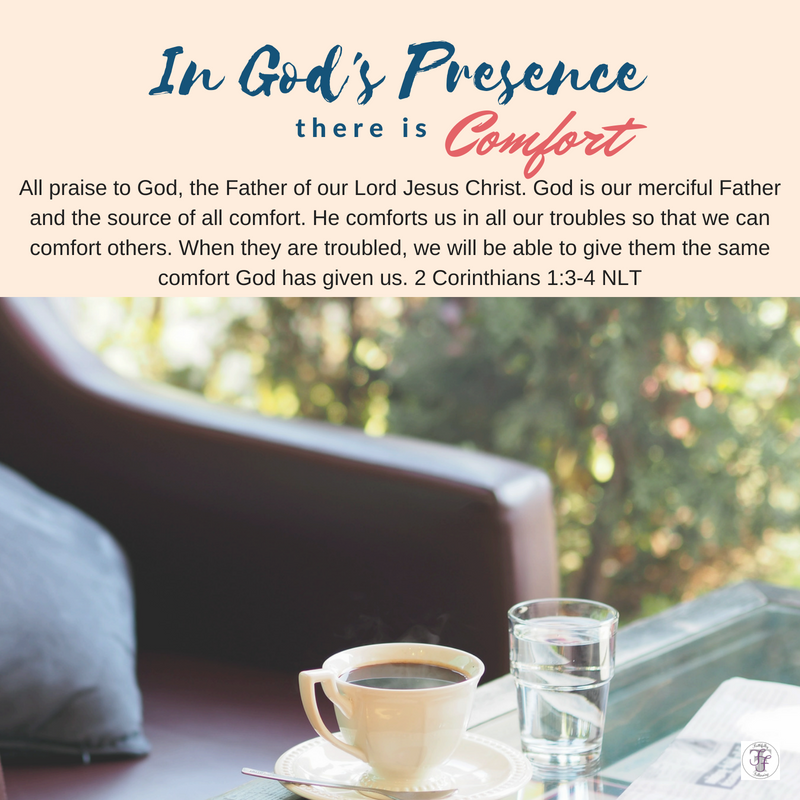 Praying that you know his comforting presence today! I love this description of going into God’s presence with our anger, disappointment, and upset feelings. It is so true, we find comfort in God’s presence when we turn those negative feelings over, but expressing them is the first step! Thanks, Betsy! Yes, it helps a lot to express how we feel before God, knowing that he understands and cares! As I read the verses from 2 Corinthians I was reminded again how our heart-shattering times will be used for good. My world as I’d known it fell apart the day my dad turned his back on our family and walked out the door. Little did I know then, that years later I’d become a teacher and be able to use that experience to comfort and reassure student after student throughout my career. 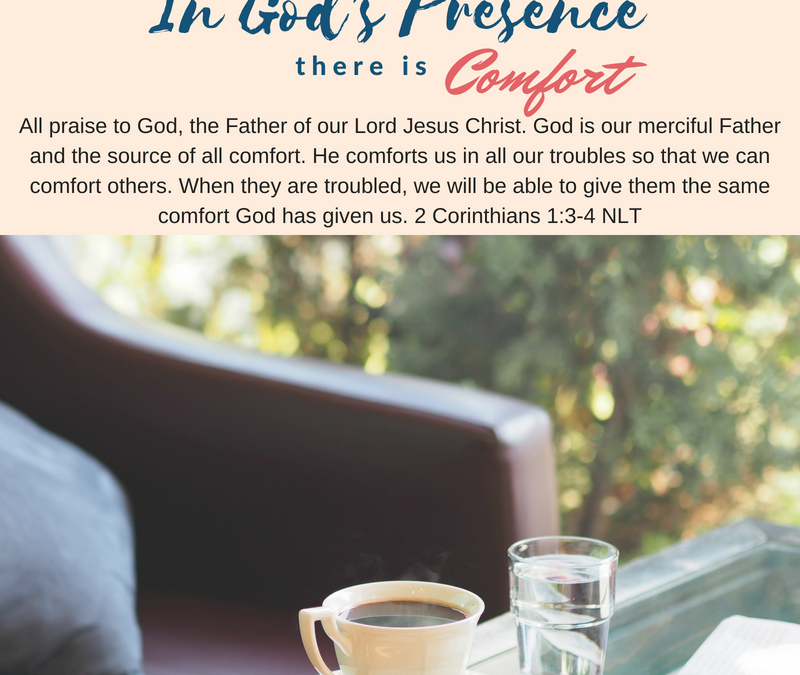 My life has shown me that truly; “we will be able to give them the same comfort God has given us.” Thank you Lesley for this great reminder that we can take the good, the bad, and the ugly to God and that He will give comfort to our souls. Thanks for sharing part of your story, Cindy! I love that you can look back and see how God has used your own painful circumstances to enable you to comfort others! Awww, Lesley, thank you for sharing this. Your heart for people is beautiful. And your honesty in your words refreshes those who read them. I’m so thankful we can come to God in all our anger, disappointments, rage, disappointment, and he can handle it. AND, He loves us. Thank you for your words here, friend. Thanks, Jeanne! Yes, I’ grateful that we can come to God just as we are! Thanks for visiting! Who can’t relate to this? I know I can! “I was aware that my reaction was out of proportion to the current situation.” Thanks, Lesley, for reminding us that we can always turn to God, regardless of how crazy our emotions are churning inside of us. He can handle us properly and turn us back in the right direction. Thanks, Lisa! It is so reassuring to know that he understands, however we feel!